A Christian worldview maintains that in a sense the world has no bottom. The doctrine of creation out of nothing denies the eternal existence of any ‘prime matter’. There is no matter that is just ‘there,’ before God starts to work. Rather, God created everything, not just structure on top of previously existing prime matter. And God created everything by his word. The word introduces the structure and the meaning. The law of God is the continued structure for the world. The world has no ultimate independence from this word or law of God, but is utterly dependent. Understanding the world does not mean understanding the prime matter, because there is no such thing. It means understanding the world as governed by the word of God. And that can only mean understanding the word of God, for that word simply is the wisdom that gives rationality to everything we see. If science is in need of redemption, then there must be something wrong with it. But what? Vern Poythress argues that it is not the findings nor even the methodology of science but the fundamental presuppositions upon which science relies and the religious commitments of its practitioners. The process of redemption is a process by which we recognize the theistic foundations of the possibility of scientific knowledge and grant Jesus Christ rightful lordship over it. In chapter 1 Poythress argues that if there are no regularities, science would be impossible: “Without regularities, there would ultimately be nothing to study.” The question, then, is what is the nature of these regularities? Are they merely apparent phenomena? Do they have some kind of necessity? What is it about the laws of nature that makes them intelligible to human beings? And how, once we conclude something from the data, do we justify our conclusions? The regularities that scientists describe are the regularities of God’s own commitments and actions… Scientists describe the regularities in God’s word governing the world. So-called natural law is really the law of God or word of God, imperfectly and approximately described by human investigators…what people call “scientific law” is divine. Poythress’ evidence for his conclusion is that scientific law and God share common properties. For example, scientific laws are “universal in time and space.” Both scientific laws and God are omnipresent, eternal, immutable, immaterial, and omnipotent. Furthermore, scientific law is personal: “Rationality is a sine qua non for scientific law. But, as we know, rationality belongs to persons, not to rocks, trees, and sub personal creatures. If the law is rational, which scientists assume it is, then it is also personal.” His argument is that rationality is a property of persons and since scientific law is rational, it must be personal. Poythress also argues that if scientific laws are expressible in language, then they are personal. Laws can be expressed in natural language and only persons can use language. Therefore, law is personal. There is also historical president for the view that the regularity of the world is explained by appeal to some form of “word” or rationality. For example, the stoics thought that the world was governed by the Logos. Poythress cites the Old Testament creation narrative where God creates by his word and John’s description of the logos in the New Testament. All scientists believe in the existence of such regularities. And in all cases, whatever their professed beliefs, scientists in practice know that the regularities are “out there.” Scientists in the end are all “realists” with respect scientific laws. Scientists discover these laws and do not merely invent them. Real laws are in fact the word of God, specifying how the world of creatures is to function, So-called “law” is simply God speaking, God acting, God manifesting himself in time and space. The real mistake here is not a matter of divinizing nature, but of refusing to recognize that the law is the law of God, nothing less than God speaking. We are confronting God. In chapter 2 Poythress argues that if the laws of nature are identical to the words (or commands) of God, then laws tell us something about God and reflect his nature. Poythress concludes that both special and general revelation should be understood primarily in terms of the speech of God. Natural laws, then, are what they are in virtue of God’s commands. Poythress suggest that we don’t conceive of God’s speech in terms of natural human language but a divine language. In the Bible we read a translation of divine speech; in nature we observe the effects of his speech. In both the study of his word in scripture and in the study of nature we are studying the speech of God. Scientists must and do rely on who God is in their scientific practice. If scientific practice is inconsistent with scientists’ private religious views, then we just have inconsistency. What we do not have is science that is neutral with respect to religious belief. Consequently, it is not true that science will be destroyed by taking the Bible seriously. Indeed, since both the Bible and nature are expressions of God’s words, taking the Bible seriously should improve science. Poythress presents several ways in which Christians synthesize the data of modern science particularly evolutionary biology with the Genesis creation narrative. The issues are multiple and include the question of the length of the days in Genesis 1, the explanatory power of flood geology, the theological purposes of the narrative, the extent of God’s creative act in Genesis 1, the maturity of the created order, the possibility of a gap within the narrative explaining the age of the Earth, and hermeneutical issues related to how we understand the relationship between the days in the narrative and the work week of the reader. Poythress argues that there must be some integration between the data available from modern science and a faithful interpretation of Scripture. He argues that mainstream science supplies apparent evidence of an old earth. Young earth creationists have trouble making the data fit with their interpretation of scripture which posits the beginning of the earth between six and 10,000 years ago. Poythress suggests that young earth creationists should appeal to appearance of age which would provide a coherent response. A young earth creationist could argue that God had to create the universe in such a state that it would appear to be old. Light from distant stars would have to appear to have travelled for millions of years, and soil would have to appear as if it had been made from decomposing matter of formerly live organisms. Poythress provides a detailed analysis of the various ways in which Christians have integrated the data of mainstream science and Scripture. The religious only theory suggests that the Bible does not pertain to scientific fact but only to matters of religion. Poythress rejects the unnecessary bifurcation of these two disciplines. The local creation theory suggests that the creation account records only a small part—the garden—and does not tell us anything about the cosmos. Poythress argues that the transition from the cosmos to the garden does not suggest that the former should be interpreted in the light of the latter. The gap theory postulates a length of time that exists between Genesis 1:1 and 1:2. Poythress argues that the Hebrew construction and verb form does not make this plausible. The intermittent day theory suggests that God’s activity is extended over long periods of time. The six days are recorded as paradigmatic act of creation. The revelatory day theory suggests that it is six days of the life of Moses in view. This both fails to make sense of the ordinary sense of the text and according to Poythress weakens the seventh commandment, “which is about imitating God, not imitating Moses.” More plausible is the day age theory that takes the term day to be an indeterminate period of time. However, the length of the day is indicated to be an ordinary length and the days are numbered indicating their consecutive nature. Furthermore, this view would have been at odds with the ordinary experience of the Israelites. Poythress argues for the view he calls the analogical day theory. This view suggests that God “created the world in six days of work, followed by one of rest, but that these days of divine work offer an analogy to days of human work rather than identity… The entire pattern of God’s working six days and resting on the seventh forms a pattern analogical to man’s work and rest.” His main reason for holding to this view is that the seventh day continues beyond the stipulated 24 hours. In the final section of the book Poythress argues that though human beings are designed by God to do science they are hampered by sin and in need of redemption. Once redeemed, scientists will not merely be enjoying the knowledge of the world but knowledge of God himself. Just as the world is governed according to the laws of nature, which in turn are the commands of God, human beings are created by God and are able to think, speak, and know because they are made by God. Poythress argues that mankind’s dominion over nature is not destroyed by sin but is distorted. Our damaged ability to understand creation prevents our purposes lining up with God’s purposes in our mastery of the environment. However, humankind remains a privileged creature given his capacity as an image-bearer for thinking God’s thoughts after him. Consequently, God gives humankind a role within creation to function as prophet, priest and king. If the laws were actually impersonal, they would not be laws at all. They might be anything. Irrationality lies at the bottom of this assumption. If laws come out of the void, why should we have any hope that they will in any respect match what the human mind can think or imagine? It is as if a plant on earth try to grasp the thinking of a human being, or worse, the thinking of a Martian. Why should we expect that the sun will rise tomorrow, just because we have seen rise before? Maybe the laws governing human memory are changing on us and our memory of the past is completely of base. Or, if our memory is okay, maybe the laws will change tomorrow. Maybe light will never return, or the face of a jack-o’-lantern will replace the sun! Once we abandon the idea of a personal trustworthy God, little prevents our wildest nightmares from taking his place. Poythress’ main point here is not only the problem of induction but the explanation for the human mind to be able to grasp the laws of nature. His point seems to be that the laws of nature could not be immanent and if they are not imminent they would not be accessible to the human mind which has only access to what is immanent. If they were immanent, they would not be laws, and if they are transcendent, they could not be known. Poythress argues that when we exchange God for a substitute in science we attempt to reduce reality to a fundamental principle. On a Christian view we have no need to do so. Behind every observation at every level—chemistry, biology or physics—is the ultimate explanation of God. Christianity supplies an ultimate explanation for reality that does not reduce reality to something within the created order. Poythress considers what the Christian doctrine of redemption might mean for a Christian view of science. Just as the first Adam is the first scientist, the second Adam, Jesus Christ, is the final and “archetypal scientist.” Once scientists are in fellowship with Christ they become imitators of Christ. As a consequence, science is no longer done autonomously but in submission to Christ. This does not mean that scientists who are Christians will be better scientists. Rather, scientists obediently conform their minds to the rationality of God rather than rebelliously attempting to practice their discipline while denying his existence. To benefit fully from Redeeming Science one should notice the overall aim of the author to exhort the reader to consider scientific endeavors as a joyful enterprise involving discovering the mind of God in nature. This should make all the difference. As Poythress suggests, “science is all about discovering the mind of God.” Thinking of science this way is immensely helpful. Unfortunately, it is also considered unseemly among the higher-ups of the discipline. But we sorely need Christians devoting their energies to the scientific task. At the very least Poythress’ contribution should cause Christian scientists to appreciate their task differently, as a joyful adventure exploring the mind of the creator. The book is not without its weaknesses. Poythress is not attempting to offer a Christian apologetic so he does not feel the need for arguing for his position or against his opponent. The question is: why not? While helping the faithful enjoy science by regarding it as discovery of the mind of God is a worthy task, a clear defense of a Christian worldview and its relationship to the scientific endeavor is sorely needed in our era. Moreover, Poythress does claim that if science is possible, then Christianity is true. This claim is not merely encouragement for the faithful but an implicit rejection of any alternative worldview. Yet such a claim demands a defense. There were several points in the book at which Poythress could have substantiated such a claim. For example, though Poythress states Hume’s problem of induction well, he does not substantiate his claim, that the justification for induction is the personal lawgiver. The problem of induction leads him to suggest that if the laws of nature are not personal, then they are not laws. But the replies to this problem are multiple and Poythress doesn’t deal with any of them. Perhaps it is true that if induction is possible, then Christianity is true but what we need is an argument. Another example lies early on in the book. Poythress claims that, despite appearances, every scientist is committed to scientific realism. It seems quite a stretch to claim that the scientist who says he is an anti-realist is not really one at all. In fact, according to Poythress, there is no such thing as an anti-realist or instrumentalist, at least in practice. This seems to ignore the motivation behind these views. Indeed, even a Christian scientist might be motivated to instrumentalism simply by observing the changes to dominant scientific theories in the last few hundred years. Surely, the instrumentalist might reply, the changes to dominant scientific theories warrant instrumentalism, the view that though theories may or may not be true, they are useful for organizing our experiences. If instrumentalism is false, Poythress does not tell us why. We are asked to merely assume that scientific realism is true. Furthermore, it is not clear that certain forms of realism could not be exchanged for standard scientific realism. Poythress mentions critical realism but does not engage with structural realism, the view that though theories change with respect to the entities they propose to refer to, the mathematical structure of a theory may remain unchanged. Perhaps the idea is that if the laws of nature are the commands of God, then scientific realism follows but, again, we are without an argument. A good argument for this view would entail a series of refutations of alternatives, something Poythress does not provide. Alternatively, Poythress may wish his reader to grant the truth of the antecedent—that the laws of nature are the commands of God. The book then outlines what would follow from those assumptions. It shows us how science can be approached from within the Christian community. If this is what Poythress is arguing for, then it is not really a project of the redemption of science but of the reassurance of the faithful. If so, then it is a task that requires little in the way of argument against opposing views. However, if the task is to further the goal of redeeming science by convincing atheists, then the book falls short. 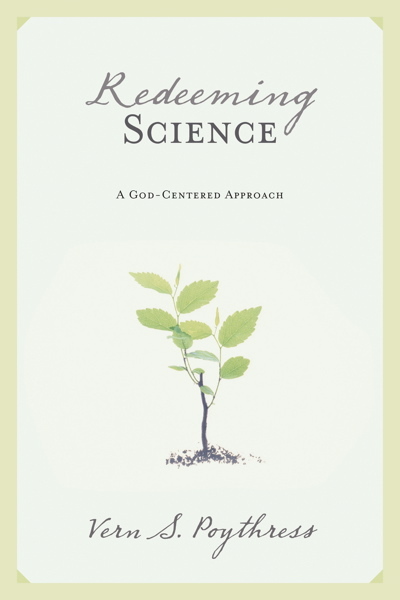 Vern Poythress, Redeeming Science: A God Centered Approach (Wheaton: Crossway, 2006), 204. Though Poythress uses the terms “scientific laws” I am going to assume he means laws of nature. Some have suggested that there is a distinction between scientific laws, the statements made by scientists to describe laws of nature, and laws of nature themselves: Michael Scriven, “The Key Property of Physical Laws – Inaccuracy,” in Current Issues in the Philosophy of Science – Proceedings of Section L of the American Association for the Advancement of Sciences, 1959, ed. H. Feigl and G. Maxwell, (New York: Holt Rinehart and Winston, 1961), 91–104. “Instead of general and special revelation, we could just as well talk about general and special speech from God… God speaks words that are not addressed primarily to human beings, such as the words directing the melting of snow and frost in Psalm 147:18. We may call these the words of God controlling the world… These characteristics belong both to the words governing creation and providence and to the words spoken to human beings in the Bible.” Ibid., 38, 41. Poythress reminds us that when Jesus turned water into wine, the wine would have the appearance of age. Alvin Plantinga argues also argues that we need “Theistic science” but are hindered by the near universal opposition to religious presuppositions in science and the failure of Christians to combine their discipline with a healthy dose of cultural criticism. Alvin Plantinga, “When Faith and Reason Clash,” in Taking Every Thought Captive: Forty Years of the Christian Scholar’s Review, ed. Don King (Abilene, TX: Abilene Christian University Press, 2011), 107. A short example of the argument I have in mind is by James Anderson who briefly surveys the options and concludes with suggesting that the existence of a personal God would justify induction: James Anderson, “Secular Responses to the Problem of Induction,” Proginosko Blog, 2000, accessed October 16, 2016, http://www.proginosko.com/docs/induction.html. John Worrall, “Structural Realism: The Best of Both Worlds?” in The Philosophy of Science D. Papineau ed., (Oxford: Oxford University Press, 1989), 139–165.